Nintendo is throwing a fresh coat of paint on its 2DS XL handhelds, just in time for the Christmas shopping season. First up is the New Nintendo 2DS XL Poké Ball Edition, announced during today's Nintendo Direct broadcast. As the name suggests, this design closely mirrors the classic Poké Ball look, including a bright red top, cream-colored bottom half and white button in the center of the lid. 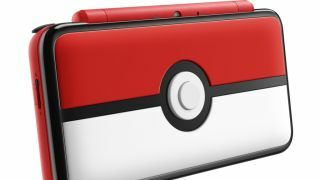 If you've still got Pokémon fever, this handheld is for you. The New Nintendo 2DS XL Poké Ball Edition can be yours on November 3. Nintendo has this version listed for a suggested retail price of $159.99 (about £120 / AU$200), though the actual price may vary depending on the retailer. Next up is the orange and white edition of the New Nintendo 2DS XL. This edition has been available in Japan and Europe, but now it's coming to North America on October 6. With a grooved white top and just enough orange accents, this is a sweet addition to the 2DS XL family. The orange and white edition of the New Nintendo 2DS XL price is $149.99 (£129.99 / AU$199.95).